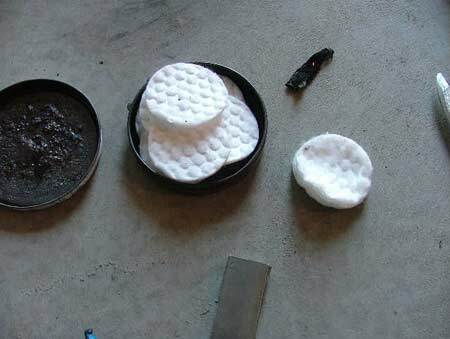 Seen here are some 100% cotton face cleaning pads. I use these and they work very well and hold a spark a long time. I use in the course I teach and it is a great "option"! 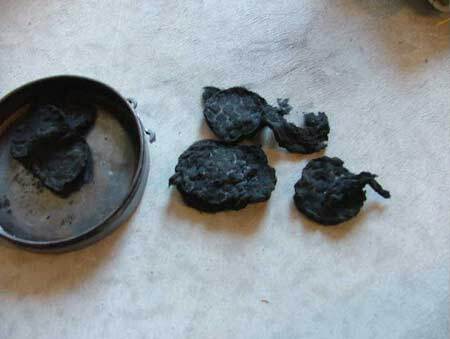 These are the face cleaning pads when there completed (charred). They are large and they hold together very well. I find these are more durable for catching spark with knife and stone, than cotton sheets that will break apart a lot easier in your hands. When you use them you will find they last a good while and aren't as prone to crumbling! These pads are what I consider an excellent spark catcher for most systems. I use them lots and I have experimented with many things to make char and work with my knife and stone system. 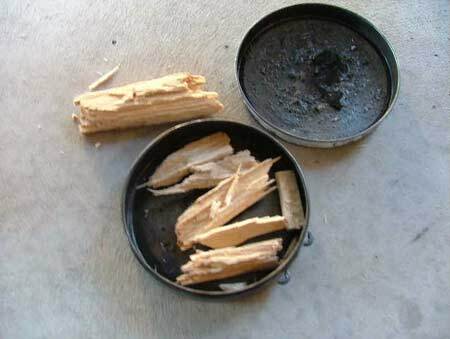 When I did my "two stone" fire starting I needed a very good spark catcher to make this fine spark generator work. I used fungus, however, this is also a great "companion". Seen in this picture is some broken Mullen pith I also use. I have found this to be a great tool for myself in the bush and I use this in many ways. 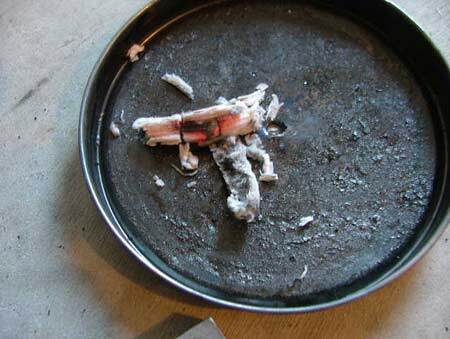 Seen here I have prepared it for charring! 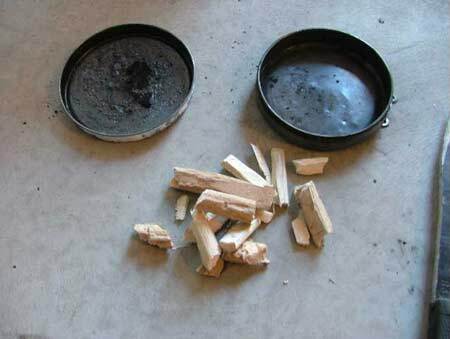 In this photo I have mixed some of my punk wood from a poplar tree as well as my Mullen fragments. These two materials are great for charring and I can find them readily in the bush when I'm out. So when your cotton runs low, look around the bush, and see if you can find any of these two materials and try them. I think you will find, as I have, that they are a great " option". I have some other systems for char in the bush, and when you scout around I'm certain you will come across these as well. These are the two materials in the completed stage and now have been lit. They catch and hold a spark well. I would personally prefer these two over my cotton char. If you need something to catch a spark quickly, is long lasting, and readily available, try this combination. And best of all, it's from the bush! 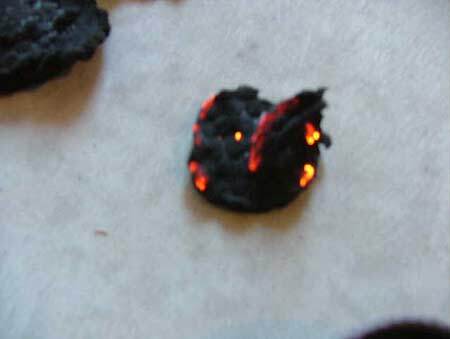 This picture shows the lit char after a couple of minutes, and the pieces are still lit and giving off some good heat! 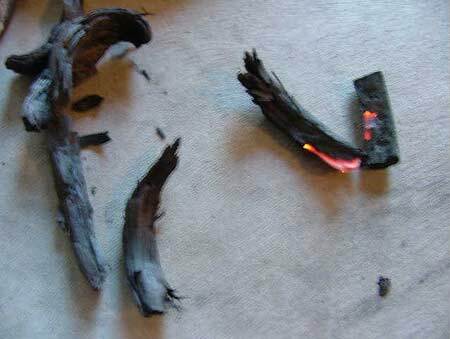 Try them, and experiment, and I'm certain like myself you will find many bush charring materials!